Romantic Violin - Blog - Follow Romantic Violin for tips and ideas on how to romance your loved one! 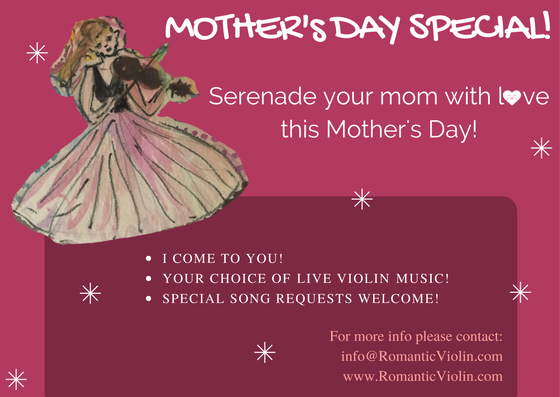 Make Mother's Day extra special this year by letting me serenade your loved ones! Mention this ad and you will receive an additional 10% off the already discounted price! What a GREAT way to spend my weekend...doing what I LOVE! I had originally played for this couple last year in their home to entertain their grandmother who was visiting fem overseas and who loved classical music. They loved it so much they asked me back, this time to play for their friends. With so much appreciation and hospitality flowing throughout the evening, how could I NOT love what I do?! Imagine a private concert in the comfort of your own home! What a great way to start the new year, with a "She said YES"! I just LOVE being a part of special moments like these. When I got the call to play atop the ATT Center in downtown Los Angeles I just knew I HAD to be a part of it! As you can see from the glorious view in this pic, the entire top floor was reserved especially for this moment. The unsuspecting girlfriend was told she was being shown a potential place for an upcoming party. Little did she know it was for her own engagement! As I played her favorite songs on violin requested by her boyfriend, he got down on one knee and the next thing I heard was "YES!" and a cork pop from the champaign bottle! It NEVER gets old being a part of moments like this. It is ALWAYS just as thrilling as the first time, and for that, I know it's going to be a GREAT new year! So, Happy New Year to you too! Professional Violinist Jennifer Argenti comes to you with over 25 yrs experience in adding the perfect touch to your romantic occasion! Here Jennifer will share her tips and ideas on how to make your moment an absolutely unforgettable one!